The information and photos on this page are from many sources. We have done a lot of research ourselves, especially searching through old newpapers and records and visiting places of interest. The assistance of other Barley/Barlow descendants, including Bev Bisaro and Jodie Worboys, has been invaluable. Please contact me if you have additions, corrections or questions. I would particularly like to hear from you if you are related to our branch of the Barlow/Wilson family. Edward Gribben Wilson was born on 10 August 1814 at Belfast, Ireland. His parents were William Wilson and Elizabeth nee Sanders. The family appear to have relocated to Lancashire but no further information has been found until the 1841 England census, when Edward is recorded as a 26-year-old tin plate worker living in Bury, Lancashire with the family of John and Betsey Hodgson. Edward died on 8 December 1890 at Penrith, NSW, Australia. In the List of English Patents from July 29 to August 26, 1848 he is recorded as having taken out a patent: EDWARD GRIBBEN WILSON, of Bury, in the County of Lancaster, tin-plate worker, for his invention of certain improvements in the construction of tin drums or rollers used in the machinery for drawing, spinning, doubling, twisting, and throwing cotton, wool, silk, flax, and other fibrous substances. Sealed August 1, 1848. (Six months.) The full patent was enrolled in February 1849 and is detailed here. Edward Gribben Wilson, Bachelor of Clerke Street, Tin Plate Worker, married (1) Elizabeth Collins (1809-1851), Spinster of Freetown, on 21 August 1838 at St Mary the Virgin in Bury, Lancashire, England. The groom's father is recorded as William Wilson, Cotton Spinner; the bride's father is recorded as James Collins, Shop Keeper. John Alfred Giles (1874-1955); Joseph William Giles (1877-1878); Ernest Frederick Giles (1879-1946). She was born on 18 May 1843 at Bury South, Lancashire, England. She arrived in Port Phillip Bay on the Kate on 13 April 1853, at the age of 9 years, with her widowed father and two sisters. 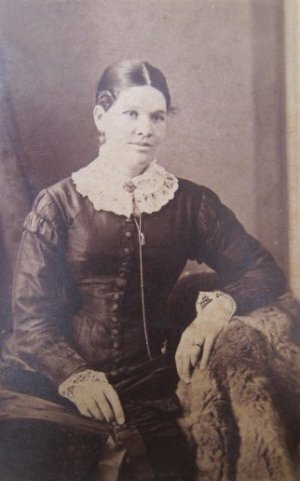 She married James Smith McCoy (1837-1878) on 24 April 1865 at the Wesleyan Church, Redfern, NSW, Australia. She died on 21 August 1901 at Darlington, NSW, Australia. Eliza and James McCoy had 7 children. She was born on 5 October 1844 at Bury South, Lancashire, England and died on 2 February 1846 at Bury South, Lancashire, England. He was born in February 1846 at Bury South, Lancashire, England and died in 1846 at Bury South, Lancashire, England. She was born on 19 June 1848 at Bury South, Lancashire, England. She arrived in Port Phillip Bay on the Kate on 13 April 1853, at the age of 3 years, with her widowed father and two sisters. She died in 1929 at Ryde, NSW, Australia. She was born in about February 1851 in Radcliffe, Lancashire, England; her mother died a few months after her birth; she did not come to Australia with her father and sisters. On the 1851 England census she is recorded as Sarah, one month old, living with her parents and siblings. In the 1861 and 1871 England census she is shown as living with the Holmes family in Radcliffe, as a boarder in 1861 and then as their adopted daughter and a cotton weaver in 1871. In the 1851 England census Edward Gribben Wilson is recorded as a 36-year-old Tin Plate Manufacturer; living at Lower Green Street, Radcliffe, Bury, Lancashire. His wife Elizabeth is recorded as 42 years old, born in Radcliffe, Lancashire. Living with them are their children Jane an 11-year-old scholar, Eliza an 8-year-old scholar, Mary H age 3 and Sarah age 1 month. There are two house servants living with them. Elizabeth Wilson née Collins died in May 1851 at Radcliffe, Lancashire, England, at age 42 years. On 13 December 1852, Wilson and three of his children, Jane (13), Eliza (9½) and Mary Ellen (4) sailed from Liverpool with 372 other steerage passengers on the Kate. They arrived in Port Phillip on 13 April 1853 in the second year of the goldrush, when Melbourne was overcowded and accommodation was hard to find. It is not known exactly when they relocated to Sydney, but there is a "Wilson, Edward G" in the list of unclaimed letters published in The Argus (Melbourne) on 25 January 1855. On 9 January 1857, at Penrith, New South Wales, Edward Gribben Wilson (1814-1890) married Elizabeth Barlow (1837-1924); it was her first marriage and his second. Annie Ida Emily Smith (1893-1946). She was born on 26 October 1859 at Sydney, NSW, Australia. She married Henry Australia Philip Mugridge (1857-1941) on 31 March 1881 at Bathurst, NSW, Australia. She died on 24 October 1939 at Waverley, NSW, Australia. Mary Ann and Henry Mugridge had 5 children. He was born on 14 September 1861 at Sydney, NSW, Australia. He married Margaret Reid (1871-1945) on 16 November 1904 at Willoughby, NSW, Australia. He died at age 100 years on 31 July 1962 at Chatswood, NSW, Australia. She was born on 23 August 1864 at Sydney, NSW, Australia. She married Benjamin Tredrea (?-1913) on 8 February1892 at Penrith, NSW, Australia. She died on 11 December 1934 at Orange, NSW, Australia. Emily and Benjamin Tredrea had one child. She was born on 14 May 1867 at Penrith, NSW, Australia. She married Joseph Rickard (1867-1925) on 16 May 1888 at Bathurst, NSW, Australia. She died on 10 November 1931 at Kogarah, NSW, Australia. Annie and Joseph Rickard had 4 children. Unknown Wilson ("one male deceased" is listed on Elizabeth Wilson née Barlow's death certificate). 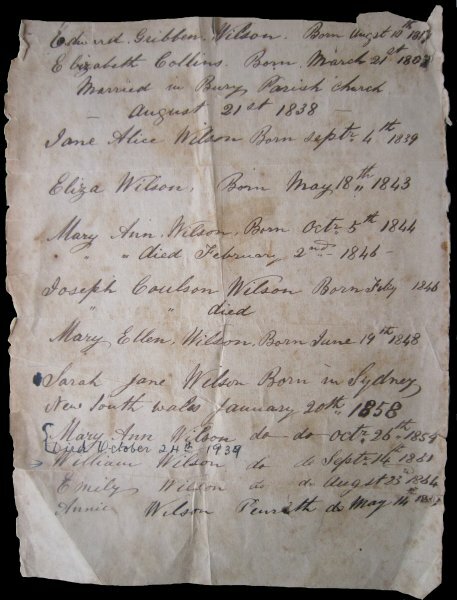 Page from Wilson family bible showing Edward Gribben Wilson and his children from two marriages. In about 1857, Edward G Wilson set up in business, initially in partnership with Robert Pitt, as "Galvanized Iron Workers and Lamp and Oil Sellers" at 599-603 Brickfield-hill (George Street), Sydney, NSW. (George Street south of Liverpool Street used to be known as “Brickfield Hill” because many of the bricks used to build early Sydney were excavated in the Liverpool St area.) The Sands Directories of 1864 and 1865 list Edward Gibben Wilson as a galvanised iron worker at this address. Sarah Jane was born at this address in 1858, but by at least 1864 the family had a private residence at 62 Buckingham-street, Sydney, NSW. Wilson claims "the empty honor of being the first to practically prove that kerosene oil can be made in the colony from material found within itself" and suggests that if the trade in kerosene oil reaches the magnitude anticipated by some, Brickfield-hill as its birthplace in the colony should "bear with honour" the title of 'Petrolia'. On the subject of kerosene, Wilson wrote two passionate letters to newspapers: EG Wilson's 1865 Letters to the Editor re Kerosene. In July 1865, Wilson sold the business carried on by me as Galvanized Iron Worker, at No. 601, Brickfield-hill, to Mr. Thomas Wearne, for whom I beg a continuance of the support awarded to me for the past eight years. [The Sydney Morning Herald, 29 July 1865]. The family moved to Penrith where the last child, Annie, was born in 1867. In the Supreme Court of New South Wales. Sheriff's Office, Sydney, 20th March, 1866. G. EVANS v. EDWARD G. WILSON. Death of an Old Resident. — We are again called upon to record the death of one well-known as an old resident in this city, Mr. Edward Gribben Wilson. 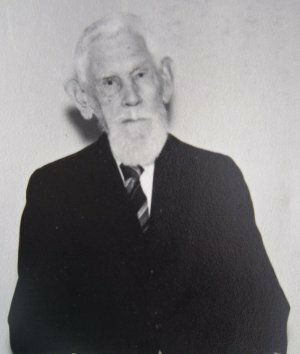 Mr. Wilson, who was the father of Mrs. George Smith, Mrs. Henry Mugridge, and Mrs. Joseph Rickard, and Miss Wilson of this city has lately made his home at Penrith, where he died on Monday last at the advanced age of 73 years. The funeral took place on Tuesday, the remains being interred in the Castlereagh Cemetery near Penrith. Besides the members of his family still in Bathurst, Mr. Wilson leaves a widow and one unmarried son, Mr Wm. Wilson, now residing in Penrith and two daughters Mrs. J. McCoy and Miss Ellen Wilson, who are living in Sydney. 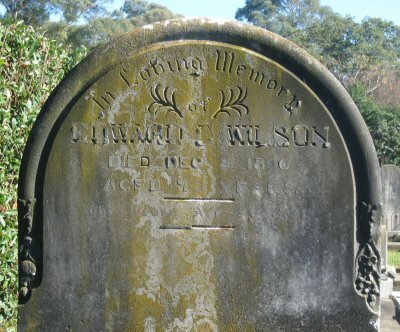 Elizabeth Wilson née Barlow died at age 86 on 19 March 1924 at William Street, Orange, NSW, where she had been living with her widowed daughter Emily Tredrea née Wilson. She is buried in the Methodist section of the Cemetery at Orange. Elizabeth Wilson née Barlow with son Wlliam Wilson c1861.